Reviewed by Donna ~ 5 Dystopian Stars!! Now before you all hang me up and batter me, I have to admit, this is my first dystopian book…shock, horror, gasps etc. etc. This genre of books has never “called to me” I was never a fan of paranormal either until I was told I had to read the Premonition Series by none other than Amy Bartol herself. Amy totally and utterly captivated me with that series, so much so I had to read all the books back to back and now I am anxiously awaiting Iniquity, now I have to add also anxiously awaiting Kricket #2! This book totally and utterly blew me away, I couldn’t put it down, it starts with the cover…I mean, how damn perfect and beautiful is that cover!! From the first till last page I was swept up in this fantasy world, I was all things Rafe, consumed with new knowledge about this new world that I knew absolutely nothing about. We were in the same boat as Kricket though as she knew nothing either, so I felt as if we were learning together. It was a journey, but only the beginning, a voyage of discovery, learning ones heritage, finding yourself finally, understanding, a sense of belonging but also that fear of the unknown. It was a sensory journey and one that I will not forget in a hurry. Kricket is as adorable as she is feisty, but she is a survivor. She has been passed from foster home to foster home, never once feeling like she belonged, always feeling that she was different. Of course she was who else would have piercing violet eyes? A freak of nature…or perhaps a sought after child from a faraway planet, a child that held the key to prophecies that may or may not come true. A valuable commodity, but Kricket is a person and now it is up to those to keep her safe and alive from the vultures that are now circling now that she has been found. She is an asset to any “house” but which house wants her protected and which house wants to just use her for their own gain? The story begins with Kricket trying to stay under the radar until she reaches 18, but that is hard for a 5ft 10, blonde goddess with piercing violet eyes. Having escaped the system she has just a few months until she is finally an adult and can breathe again, that was until some tall, violet eyed men approached her saying that they were going to take her “home.” She runs and manages to escape only to run into a different group of men claiming the same thing. She is now stuck between a rock and hard place, but Kricket has this hidden talent, she can tell when someone is lying and knowing that the first group of men lied and were now fast approaching to capture, she goes with her gut instinct and trusts the second group, after all, they were telling the truth. She is soon transported to Ethar and this is where the story really kicks off. The planet in question is Ethar; the houses are Rafe, Alameeda, Comantre, Peney and Wurthem. Let the battle commence. Her “rescuers” are Trey, Jax and Wayra, while they say they are taking her back home so that she can pay her penance, it was their mission to bring her back safe and sound. She can’t help but trust them, they haven’t lied, they are friendly and they really do seem to have her best interests at heart. It is on this trek back to Ethar where they have to navigate some awful and life threatening terrain that she begins to see the people behind the façade, friendships are formed, some more than others. It is obvious Trey and Kricket have this chemistry but Trey has his own problems and demons to fight and another woman thrown into the mix is not on his list, but chemistry has a different opinion. It is now up to these two to see where it takes them and if they can battle to be together, or will the Ethar houses have their own theories as to how this story will end? All the characters in this book are written superbly, such is the powerful way this book was written, you loved the characters you were supposed to and absolutely detested the ones you weren’t. I loved reading the development of their relationships, from blatant distrust, to trusting, friendship, loving and caring and then an all-out, protect this woman at all costs. 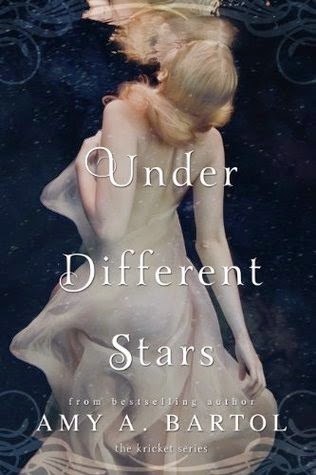 Amy Bartol always delivers a compelling read and this is no different, the slow build, the intensity, the chemistry, the beautiful descriptive writing that gives you the ability to picture yourself in this world and living what the characters were experiencing. It is no mean feat to be able to capture your imagination with that much force that you end up picturing, believing and living. I have always said that the Premonition series should be made into a movie; I feel exactly the same way about this one. I cannot wait to see where this series is going to go, but I seriously cannot wait for more Trey and Kricket. Once again Amy Bartol, I take my hat off to you. The sensory overload that you have conveyed through words is truly astounding. I absolutely love your writing style, a certain 1click author for sure and I am now waiting on tenterhooks for the next instalment, whether it be Iniquity or Kricket #2, I am there, finger poised, ready to buy, read and devour. Totally and utterly fantastic, for those fans that are dystopian lovers, what are you waiting for and for those people like me, take a chance, buy it, read it and devour it like I did. I am now an official dystopian convert or maybe I am just under the Amy Bartol spell? Who knows! !